The 2013 BMW X5 hasn't changed severely from its debut for the 2000 model. In some ways that's a good thing and in other ways not so much. It is still only in its second generation of production, so maybe BMW still some bugs they're working out. Either way, the X5 still represents everything BMW has represented for a very long time - luxury, sophistication and performance. Most drivers may be put off by the 2013 BMW X5's price tag but they would be doing themselves a discourtesy to not at least test drive one. The X5 exhibits the driving prowess that has made BMW one of the top German manufacturers. It also has enough safety features and technological gadgets that it should appeal to any consumer in the market for a large family vehicle. The 2013 BMW X5 comes in five different trim levels: xDrive35i, xDrive35i Premium, xDrive35i Sport Activity, xDrive35d, and xDrive50i. Every trim comes with all-wheel drive, hence the "xDrive" marker on each level, and there is even a high-performance version called the BMW X5 M, but that is a performance machine that is quite the jump up from the standard X5. Standard equipment on the base trim level, the xDrive35i, includes automatic bi-xenon headlights, LED running lights, foglights, keyless ignition, cruise control, dual-zone automatic climate control, 10-way power front seats with memory function, Bluetooth, iDrive interface, leatherette-vinyl upholstery, BMW Assist emergency communications, and a 10-speaker sound system with CD player, HD radio and iPod/USB/aux inputs. The xDrive35i Premium, xDrive35d and xDrive50i share a bunch of standard features; they include heated front seats, leather upholstery, front and rear parking sensors, panoramic sunroof, power-folding and auto-dimming mirrors, power liftgate, and a power-adjustable steering wheel. The xDrive35i Sport Activity adds some performance items like sport-tuned suspension, a sport steering wheel, sport seats, and darker exterior trim. There are also several options packages available for all trim lines, all of which enhance the X5 to be a more technologically advanced luxury machine. The interior of the 2013 BMW X5 is sort of give-and-take. You do get quite a bit of luxury and comfort, but there are some trade-offs. The cabin features an upscale look and feel, displaying high materials quality and elegant style. The dashboard is a twin to its little brother, the X3. The wood grain accents give it a Park Avenue kind of class without giving it a gaudy look. All controls are well placed and easy to reach but there are still some complaints about the iDrive system's performance. The seats are comfortable and supportive but you may want to steer clear of the optional third-row seat unless you're planning on driving a group of munchkins around; it is only spacious enough for the people of Lilliput. Even in five-passenger versions the rear seat is cramped on legroom, though headroom is spacious. Small items storage is very good as there are crevices and pockets throughout the cabin. The power liftgate is a nice feature to have to take advantage of the X5's 75.2 cubic-foot maximum cargo capacity; that is, of course, with the rear seat/s folded down. Cargo capacity with the rear seat/s in position is 21.9 cubic feet, which is very good for this segment. Buyers who want to take advantage of all the interior technologies, such as the heads-up display and the adaptive cruise control, will have to upgrade at least one trim level because the xDrive35i does not offer them. The standard xDrive35i gets a turbocharged 3.0L inline-six-cylinder engine that gives a production of 300 horsepower and 300 ft.-lbs. of torque. It comes fastened to an eight-speed automatic transmission. As we said before, all-wheel drive is standard on all trim levels of the X5. The EPA-estimated fuel economy for this engine is 16/23 mpg (city/highway). The M Sport package increases the power of this combination to 315 horses and 330 ft.-lbs. of torque. The xDrive50i get a twin-turbocharged 4.4L V8 engine that hammers out 400 horsepower and 450 ft.-lbs. of torque. The M Sport package will up that power even further to 440 ponies and 480 ft.-lbs. of torque. It also comes with the eight-speed automatic transmission. The EPA's fuel efficiency estimate for this engine is 14/20 mpg. That's actually respectable for a twin-turbo V8. The xDrive35d is the diesel-powered animal of the X5 fleet. It gets a turbo-diesel version of the 3.0L inline-6 that wallops out 265 horsepower and 425 ft.-lbs. of torque. Any engine you put into the X5 doesn't seem to change the driving experience. When you're in the X5, you know you're in a luxury automobile. Road noise is nicely muted and the ride is smooth yet a bit firm, no matter what the road condition. Handling is superb and crisp on the road but unlike its smaller counterparts the X5 can feel heavy at lower speeds. The 2013 BMW X5 has not yet been evaluated by the Insurance Institute for Highway Safety or the National Highway Traffic Safety Administration. Standard features on the X5 include antilock brakes with automatic brake drying, stability and traction control, side curtain airbags, adaptive brake lights, and BMW's Assist emergency communications system. There are currently no safety recalls on the 2013 BMW X5, but there have been a few issues from current owners regarding repairs within the warranty period. J.D. Power and Associates gave it 2.5 out of 5 in their Vehicle Dependability Study, which is actually a bit below average. The X5 is covered by a 4-year/50,000-mile manufacturer's limited warranty. MSRP ranges from $47,500 to $64,200. 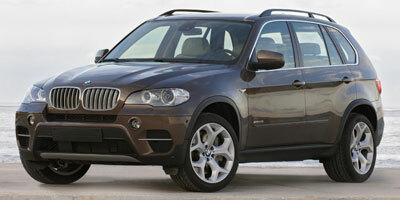 The 2013 BMW X5 diesel starts at $56,700. Interested to see how the 2013 BMW X5 ranks against similar cars in terms of key attributes? Here are the 2013 BMW X5 rankings for MPG, horsepower, torque, leg room, head room, shoulder room, hip room and so forth.